A new signing choir category has been introduced to the annual Thanet Music and Drama Festival. 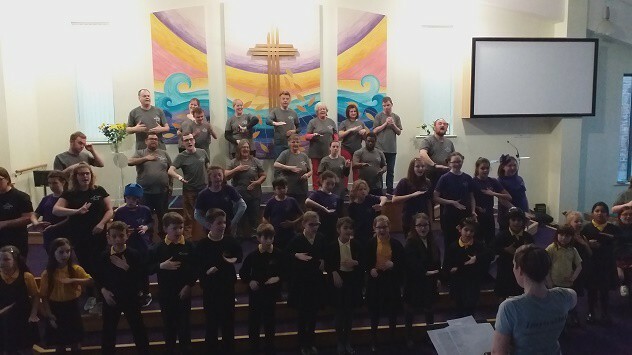 The section, which is open to any choirs who perform their songs using British Sign Language, was launched by Inspiration Creative CIC with the help of festival speech and drama convenor Lynn Myhill. Thanet has the highest population of BSL users in the country, according to Hearing Times, and the festival organisers and Inspiration Creative are keen to promote BSL to hearing people whilst also making the festival a more inclusive event. During the first Signing Choir event held at Queens Road Baptist Church in Broadstairs in March the debut contenders were the Signing Choir from Bromstone Primary School and the Inspiration Adult Sing and Sign Choir, both under Zoe and Peter Hammond, and the Inspiration Youth Sing and Sign Choir under Hazel Nurjandoa. 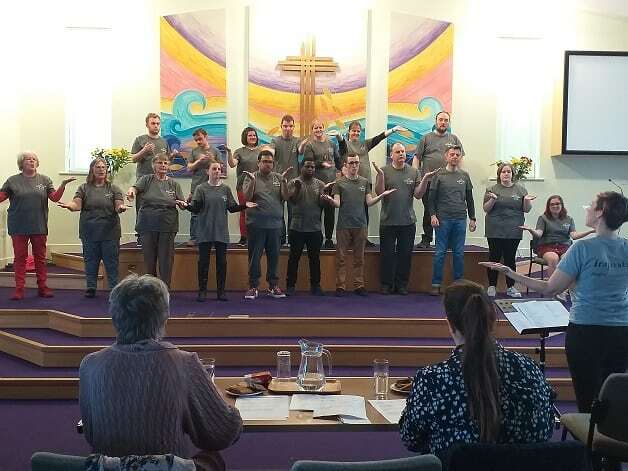 The choirs were required to perform two contrasting songs each and, whilst observing a meaningful translation, they also considered how to be expressive and theatrical in their performances. Three Thanet volunteer signers stepped forward to help set the criteria and to be the first ever adjudicators – Briony Gray, Elizabeth Mincer and Leigh Bellem. The trio were supportive and gave feedback which has been encouraging for the three groups. The groups then came together to perform ‘A Million Dreams’ from the musical ‘The Greatest Showman’ as a large combined choir at the Gala event which concluded the festival. The event was attended by the three towns mayors and a packed audience. The choir leaders, along with Lynn and the Chairman John Myhill, would like to encourage new signing choirs to come forward to enter next year’s festival. Zoe and Peter from Inspiration Inclusive are also advocating for hearing and deaf people to come together and to learn from each other. I think it’s very important for children and community groups to learn BSL so they can communicate with other deaf people. I, myself am a deaf elder, I joined the Inspiration Adult sing and sign choir 3 years ago. I feel signing makes the music come alive as we sign. Hopefully performing with singing and signing will make people interested and want to learn BSL. I felt the emotion of the beautiful signing. I really enjoy attending the group and pleased the children and adults could sign together in the Gala. What an excellent idea to have a signing choir category in the Thanet Musical and Drama Festival. 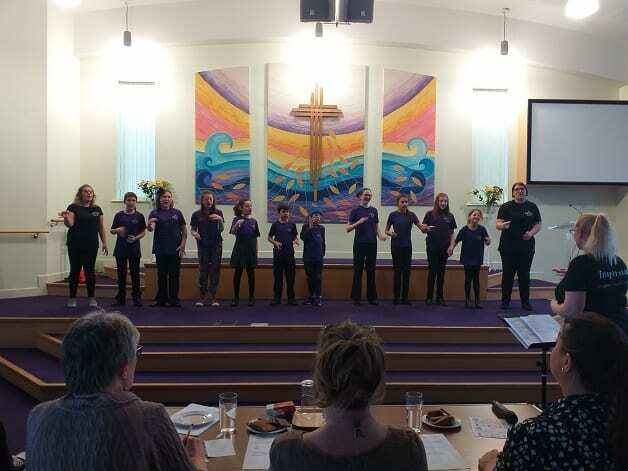 We came along to watch our daughter who is profoundly deaf in the Adult Signing Choir and we were thrilled to see hearing people in the adult and youth choirs as well as Bromstone Primary School’s signing choir. Having this category in the festival will make our deaf community feel part of the bigger community and is an opportunity for hearing people to learn the vocabulary and grammar of British Sign Language. 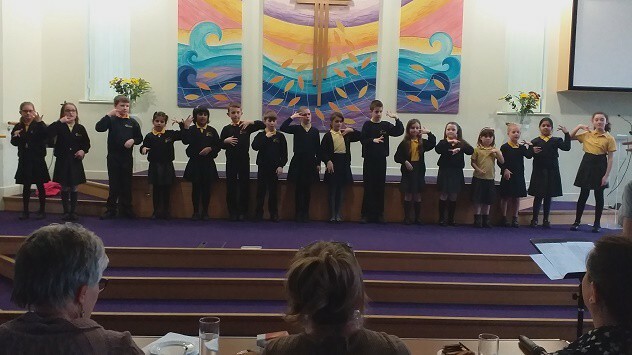 Well done to all involved, and thank you for such an inclusive, visual and musical afternoon! The Signing Choir festival was my first introduction to the work of Inspiration. I enjoyed every moment and at the same time was incredibly moved. Watching everyone, performers and audience, come together and enjoy the music was absolutely beautiful. Music brings so much joy. At the Signing Choir Festival, everyone came together and everyone was equal. Inspiration Inclusive is running a free event today (April 13) and next Saturday (April 20) in Margate with Stretch Outsider gallery. 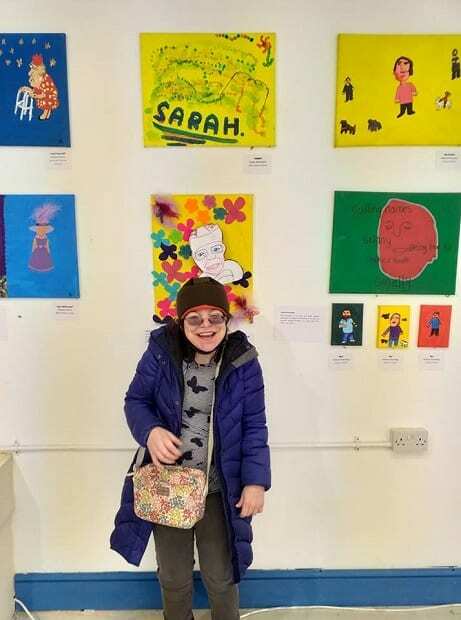 It takes place at the gallery in The Centre (opposite Peacocks shop in Margate) from 1pm-5pm and is for people of all ages to come and make bracelets or key-rings, paint small clay tiles, draw self portraits and generally enjoy the artwork on display. It’s all been created bythe Inspiration Adult Art Group, which includes people with disabilities, people who are deaf or deaf/blind and people with mental health difficulties. The aim is about creating positive labels for ourselves and getting rid of the negative labels that people get in society.